A long stone gravel road northwest of Denton about halfway between it and Sanger juts off from the service road and leads into the countryside. If one were to follow this road, they would arrive at a mesh fence with rows of trailers lined up in front of something unusual this far out of town: a race track. This track is no ordinary racing track, however — it belongs to the North Texas Karters organization, a members-only club for those who enjoy racing go-karts. It is on this track that the organization is currently hosting its Summer Club Race Series. 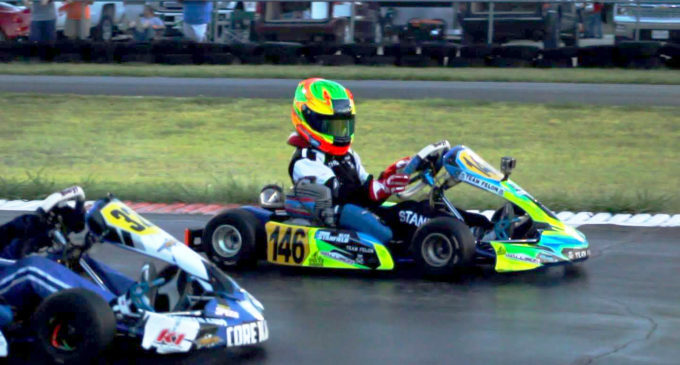 There are two more events left in the North Texas Karters’ summer series: the first on July 28 and the second on August 4, with future racing event schedules posted on its website. The facility lies largely on flat ground and is surrounded by a chain-link fence. The track itself is a professional-looking track consisting of nine turns and two long straights. North Texas Karters, commonly known as NTK, manages the track and is owned by the roughly 140 members of the group. The group’s key positions, like president and board of directors, are chosen by the dues-paying members of the organization. Similar to a private golf club, members are allowed to use the track whenever they have the time to practice. But, unlike other more traditional karting places, NTK does not have rental karts — each member is presumed to have their own kart they upkeep and use. NTK members are not limited to adults. Kids as young as 5 can come and compete in their own categories against others of the same age. While the NTK race track does hold events for the traveling race series that run throughout Texas, the most common races for the local members to participate in are the club races held by NTK, which are exclusive to members. These club races are hosted yearly and are broken up into a spring, summer and fall series with six races each season. These races are then further broken up into divisions based on the age of the racers and the type of karts being raced. The races themselves are divided into time trials and pre-finals, which determine the overall standing of drivers for yearly club points. Once the races start, observers are able to watch from bleachers on the sidelines as race after race follow each other, with only a few minutes separating each heat. To those looking to get in the scene, it becomes clear that karting is a sport for those who have the disposable income to afford all of the necessary equipment. In addition to getting a kart and the equipment to go along with it, there is always the matter of transporting it safely, along with where to store all of this gear when are not racing. This, however, is for racing locally — once you start thinking about going around the country for events, issues of entree fees, some of which can top $1,000 for a single series of races, come into play. While there are two major reasons why people love karting, the most common story of how people got introduced to the sport tends to be because a family member introduced them to it. Ray said most of the younger members at NTK were introduced by a family member when they were young, and that interest tends to stay until they reach their late teens and are able to drive real cars. Apart from the family connection, one of the two reasons Ray said that people love karting is the competitive aspect of the racing. NTK racer Sarah Bradley, 8, falls into this category of go-kart racers. Sarah got into the sport when she was only 5 by watching NASCAR, which is when she decided she wanted to compete in the same way. Sarah said it can feel like girls against boys in this male-dominated sport, but she focuses mostly on the race and winning. This desire to participate in racing was supported by Sarah’s parents, who now take her around the country to compete in events in her Hello Kitty helmet and matching doll. Sarah’s mom, Monica, is not only Sarah’s ride to these events with their air-conditioned trailer but also helps manage the technical aspect of the kart with her husband. One of the other reasons Ray said people race go-karts is for the sense of community that comes with being around fellow racers who share that passion for racing. Thomas Jackson, a former national champion who recently decided to come back to the sport, admits that a lot of his interest in the sport is about going fast and pitting skills against peers. On the other hand, Jackson loves the ability he has to meet and befriend people from around the world he would have otherwise never met. To catch the next the next race in NTK’s summer series, visit the group’s website or Facebook page for more details.